The night sky in spring harbors many galaxies that are prime imaging targets for the Astronomical Telescopes for Educational Outreach remote online telescope. However, there are other deep-sky gems such as NGC 4361, a 10.9th magnitude planetary nebula in the constellation Corvus, the crow. Insight Observatory's Systems Engineer, Muir Evenden, noticed the object in the Kstars planetarium software he uses for selecting objects to image. After Muir decided to make a go at it and processed the image he found the characteristics to be interesting as the remaining central star of the nebula that is left from the gas expanding outward was extremely apparent. Image by Muir Evenden - Insight Observatory. 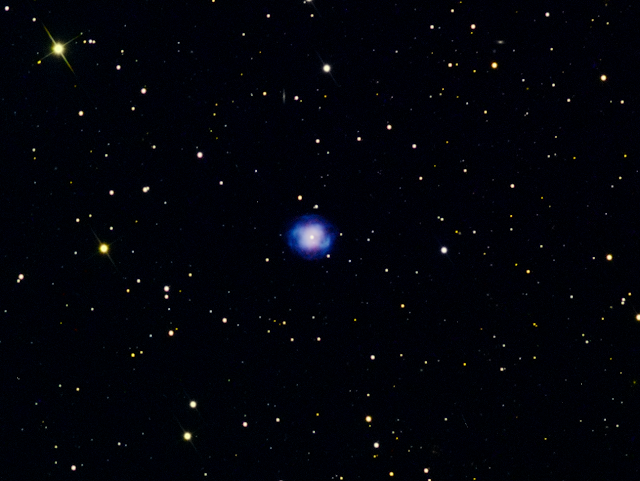 The above is a zoomed in and cropped the image of planetary nebula NGC 4361 that was taken and processed by Muir on the evening of May 11th. One of the benefits of having a sky coverage of 1.36 x 1.36 degrees with this remote robotic telescope is being able to display objects with the full CCD image size of 4096 x 4096 pixels as well as being able to zoom in and not lose the quality of the image. As mentioned in previous blog posts such as "Hidden Galaxies", it is exciting to detect other objects in the frame of the targeted object. In this image, you may see a faint edge-on spiral galaxy between two stars halfway up above the planetary nebula in the image frame. The central star of the nebula was once very much like our sun before it evolved and expanded out its outer layers. This object, called a planetary nebula, is unusual in this case as it has four lobes, or jets, of ejected material instead of the standard two in most planetary nebulae. Astronomers suspect there actually may be two dying stars inside the nebula each producing a bipolar jet. In a few tens of thousands of years, the nebula will dissipate and fade from view. However, other stars in the constellation Corvus will take its place. The stars that outline Corvus's "sail" will face that same future, and some of them in the relatively near future, astronomically speaking, sometime in the next few million years.